So after the proliferation of SciFi posts recently, I thought it was time for something historical once more. 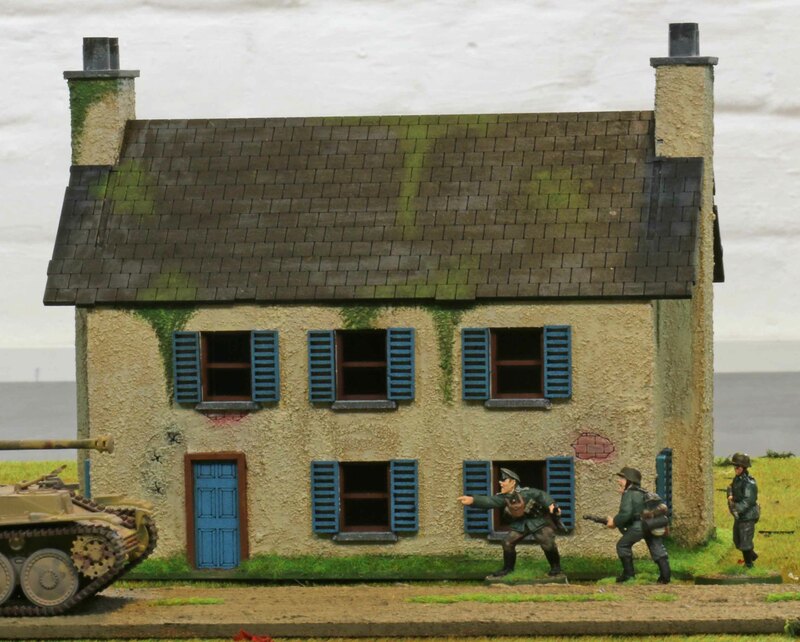 So here are some Normandy buildings. For this years Crisis, I am planning to host a WWII game set in Normandy. I had built some buildings from foamcore a couple of years ago but too few to use in a big game. 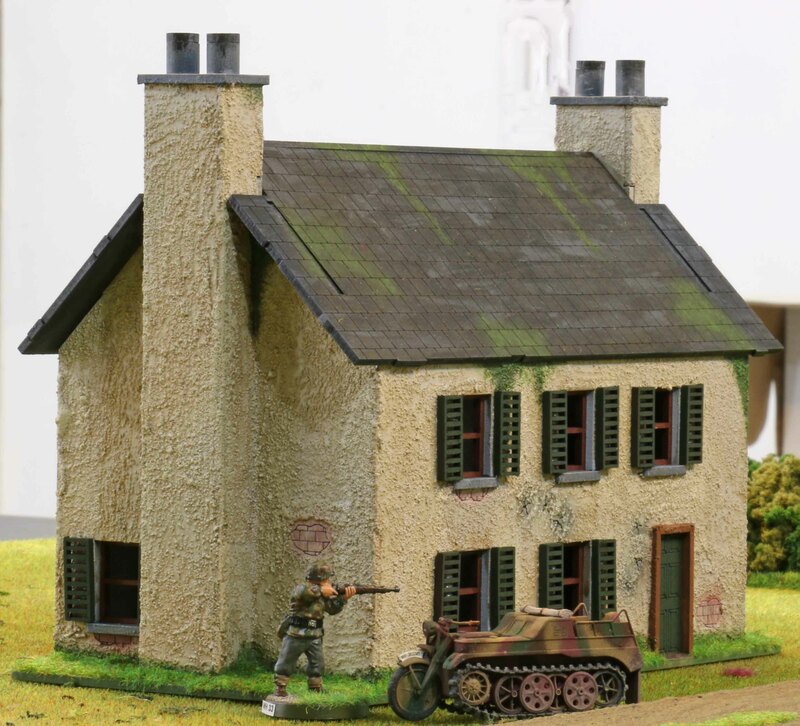 I had looked around at some of the MDF offerings out there (I have grown ever more disenchanted by foamcore), but always found them to look too British for continental Europe and especially Normandy. So my pan had been to build some from foamcore this summer or fall. But when we were in Scotland in May, I stumbled over Timeline Miniatures. Back then they did not have a proper webstore and their offerings were pretty limited, but I liked their Normandy buildings. They actually looked like Normandy to me. 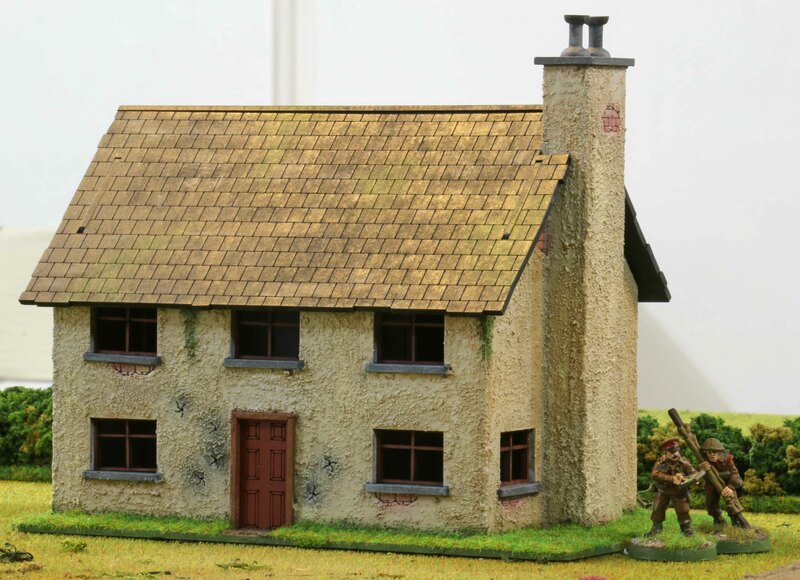 Their offering was priced more than reasonably, so I took the leap and ordered three farmhouses (two with two chimneys, one with one chimney) and ruined version each and small shed / outbuilding. When they arrived, I was quiet happy with what I got. The parts did fit very well and snug and assembled fast. The details might be a bit basic with only a few bullet holes and some brickwork shining through the plaster in a few places, but then again, I wanted something where I could express myself and for the price this was more than fair. Especially since the doors and roof came with tons of nice details! So bottom line is… The quality for money is great! Regarding the models themselves. I gave them a coat of homegrown structured paint and primed everything light grey. The bricks and bullet holes were airbrushed in appropriate color (as were the doors, shutters and woodwork, although I only fitted them when the rest was done). Over this I applied a coat of Army Painter Soft Tone and then drybrushed with a light sand colour. The roofs were airbrushed black and then drybrushed in two consecutively lighter tones of slate grey. 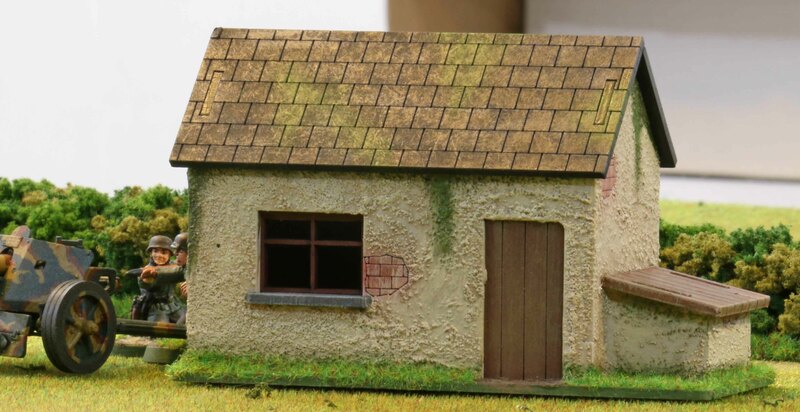 Selected parts of both the roofs and walls, as well as the lower edge of the buildings, were painted in greens to simulate moss. Inside the ruins I created some slight rises from green foam and covered it all up with the sand I use for rubble. Painted that grey, drybrushed in a lighter grey and tan as well as some brick-red. The rest of the bases got static grass and everything was done. While the roofs are removable, I kept the insides of the houses simple, with just white walls and brown floors. Thanks John! 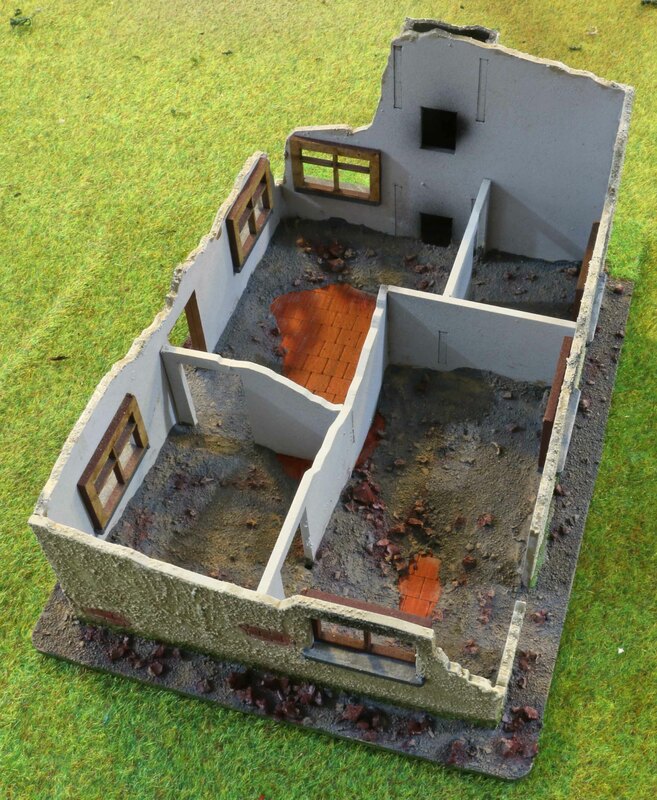 I know you are working on models and terrain for Normandy, too, so I am glad you like them! Have to say, I did not know about them till this summer either. But I am glad I stumbled over them. The moss was pretty strange to me at first. In the region of Germany where I live, you rarely see that. But I could remember this from a visit to Normandy ten years ago. You also see this a lot in Scotland and since I ordered them when we were in Scotland, the idea of moss quickly embedded itself in my mind! Superb, I love the weathering and character on these! Off to look at the website. Thanks Monty. Really glad you like them. Knowing their store and your interests, I am pretty sure there is something for you, too. Of course I like them, cracking work! I think you really enhanced the looks of the laser cut mdf houses and gave them what I personally find lacking in the raw mdf stuff: Texture and a 3D-feel. Did you spray the ‘moss’ just on with the airbrush or did you drybrush it on? They look great, I’ve been waiting a week for some to arrive having seen them on your site now, I think they will be worth the wait. I think it will be worth the wait and unless you are in some very backwater place, they should be with you any day now. Can not tell how long mine took. As I said, I ordered them while on holiday and they were there when I got home roughly two weeks later. Yes, without the texture they would be a bit too plain, but these particular models are a great canvas for this kind of enhancement! The moss was dry brushed on. At first I thought about airbrushing it, but these days I only use colours designed for the airbrush (Vallejo or AK) and I had none that fitted the shades I wanted so I went with drybrushing. Thanks Samuli. I think one of the keys to good looking tables is to use the diversity of sources available, especially in the historical sector. I think you will be able to find something there! Love these buildings, excellent work! Wonderful work Burkhard. 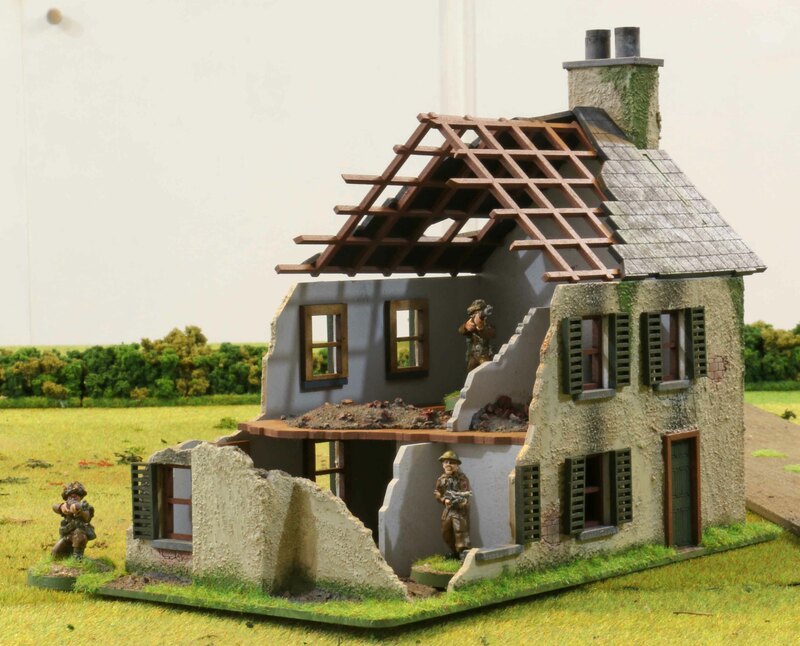 The texture (stucco) really brings the models into their own and gives them that quintessential Normandy feel. Excellent! Thank you, Curt. Glad if you feel the same about the Normandy look! I have to admit, I was a bit sceptical during the first two steps.